Home / PC Tech News / Corsair’s newer SSD Drives announced, explained and Priced: 25nm process is the new meat!! 25nm technology refers to the feature size of the transistors that are used to make the flash ICs. As the process geometry gets smaller, the capacity of the ICs gets larger, and they become less expensive to manufacture. How is it different from earlier technologies? Flash ICs based on 25nm transistors are fairly unique in that the transistors have now become so small that it is starting to become difficult to store a charge on them. Engineers compensate for this by creating very sophisticated error correcting circuits. However, while guaranteeing your data, these transistors create some overhead in terms of capacity and/or performance. Will all SSD suppliers be making this transition? Yes. Sometime later in the spring, 34nm ICs will be totally gone from the market, for all suppliers. Furthermore, 25nm SSDs is likely to become significantly less expensive then 34nm on a price-per-gigabyte basis as the technology matures. When will Corsair be making this transition? We are starting to make this transition now. We have just launched our first 25nm drives, an F80 and an F115. How can I tell what technology my drive is based on? All Corsair 25nm-based Force SSDs will have a part number that ends in “-A”. And, if the same capacity is already offered in 34nm technology, we will be very clear about noting any lowered specifications. For example, our current 34nm F80 is sold with a guaranteed read speed of 285 MB/s and write speed of 275MB/s; the F80 “-A” will have specifications of 280 MB/s and 270 MB/s, respectively. You will be able to tell what you have by looking at the part number that is printed on the drive. What are the Force “-A” capacities that Corsair will be offering? 80GB Force SSDs: We currently have F80 and F90 SSDs on the market that are based on 34nm technology, and have just launched an F80 “-A” that is based on 25nm technology. Note that the F80 “-A” uses additional flash ICs to achieve the 80GB density rating. 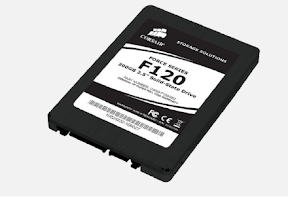 120GB Force SSDs: We currently have an F120 in the market that is based on 34nm technology. We have just launched an F115 “-A” SSD that is based on 25nm technology. As mentioned before, the reduced capacity is due to increased overhead required by the new technology. Along with the reduced size, the F115 “-A” is about $15 less expensive than the F120 at the time this article was published. 180GB and 240GB Force SSDs. Both the F180 and the F240 are currently available based on 34nm technology. Anticipated improvements in controller firmware will allow us to migrate both these products to 25nm with no loss in drive capacity. We expect to migrate these drives to 25nm F180 “-A” and F240 “-A” in late March, 2011. 40GB and 60GB Force SSDs. Both the F40 and F60 are currently built using 34nm ICs. We will migrate these drives to a new design based on 25nm technology in late March. 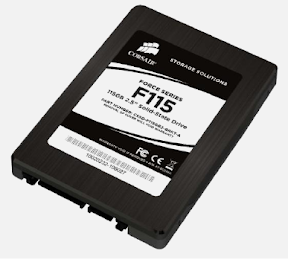 Since the capacity of these drives is already fairly modest, the F40 “-A” and the F60 “-A” will use a design that maintains density, increases performance, but will cost nominally more as a result. What performance differences should I expect to see with Force “-A” drives? To give a reasonable idea regarding performance differences, we have run testing of the F120 SSD against the F115 “-A” SSD and the F80 “-A”. All tests were run on the same individual test platform, and both drives were fresh from sealed drives. While there are indeed performance differences, the F115 “-A” performs competitively with the F120. The F80 “-A” is slower in some tests, though this is due in part to the different drive implementation. We will update these results with the 34nm F90 as the results are available; this will provide a better head-to-head comparison with the F80 “-A”. The complete set of test results are included at the bottom of this blog post. 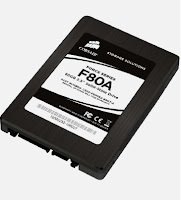 How long will Corsair continue to sell 34nm Force SSDs? Well, to be honest, we will continue to sell them until we run out of them! If I had to guess when that will happen, I would say it will begin to happen sometime in mid to late March, 2011. That pricing is MRP so it goes without saying that the street price will be lower than quoted. How much will they sell is a bigger question, now that Old school giants are into hybrid drives. Corsair gave a basic idea about the reason to implement and given a small idea about its performance on the quote above. Once Corsair India guys are able to forward me samples, I’ve able to give you guys a rundown. To give even more information, these drives are with SandForce controller and MLC NAND flash chips, with TRIM and Background Garbage Support. Judging by the feature, this is most likely going to come as a kit with a 2.5 to 3.5inch bracket tray, all of them armed with 3 years warranty period.